There has been much speculation as to whether we would be exposed to a car-crash or a train-wreck Brexit. But what Theresa May appears to be giving us with yesterday's speech is a Jumbo-jet crash (perhaps an Airbus A-380) on top of Whitehall. Such is her idea of pursuing "a bold and ambitious Free Trade Agreement with the European Union", an undertaking which others have tried in the recent past – the most recent being Canada, which has spent eight years now in trying to bring an agreement to fruition, and we're still waiting. The possibility, therefore, of the UK negotiating a deal (and getting it ratified) inside two years is, to say the very least, remote. These and much else, will require an institutional structure to facilitate communication and ongoing development, a form of arbitration panel or court, and a consultation body, which allows input into, and formal communication with the EU's regulatory and institutional system. With modern trade deals, there is also a huge element of conditionality, where parties are required to subscribe to common values on human rights (one of the main barriers to a free trade deal with China), on workers' rights, on environmental protection, wildlife protection and many other incidental matters. This is my way of saying that to achieve a "bold and ambitious" free trade agreement with the EU inside two years is not just difficult. It is impossible. It cannot be done. And it doesn't matter how many times it is discussed amongst the chattering classes, it still can't be done. And as if that is not bad enough, Mrs May is also talking about a transitional agreement, a "phased process of implementation, in which both Britain and the EU institutions and member states prepare for the new arrangements that will exist between us will be in our mutual self-interest". The point here is that she tells us she wants us to have reached an agreement about our future partnership "by the time the 2-year Article 50 process has concluded". That will, of course, have to include ratification of her "bold and ambitious" FTA, a unanimous decision which includes some devolved governments. But only then can the transition process be planned. Assuming that we get our FTA inside two years – which I've already suggested is impossible – we then have this further hurdle, a complex additional treaty, against an unknown and unspecified timetable. In what appears to be a sideways swipe at the Efta-EEA option, Mrs May nevertheless rails against a transitional status, "in which we find ourselves stuck forever in some kind of permanent political purgatory". This is one of many places where she has quite evidently supped liberally at the Brexiteer kool-aid. How can it ever be permanent when we can leave the EEA with one year's notice? But where she has sated herself with the kool-aid is in her comments about membership of the Single Market. "European leaders", she avers, "have said many times that membership means accepting the 'four freedoms' of goods, capital, services and people". "And being out of the EU but a member of the Single Market would mean complying with the EU's rules and regulations that implement those freedoms, without having a vote on what those rules and regulations are. It would mean accepting a role for the European Court of Justice that would see it still having direct legal authority in our country". Says Mrs May, "It would to all intents and purposes mean not leaving the EU at all", speaking straight out of the Janet and John playbook on the "Norway option". But if Norway is most decidedly not in the EU, and is a member of the Single Market, how is the same arrangement for the UK keeping it in the EU? To claim that represents a total departure from reality. And it is there that the German media finds her, with several journals suggesting that she has entered a fantasy world. Spiegel describes her as realitätsblind, which one of our commenters says you could translate as "in cloud cuckoo land". The Germans appear considerably less than impressed with May's threat to "walk away", and her assertion that: "no deal for Britain is better than a bad deal for Britain". They are right to be unimpressed. As Pete has pointed out, this is not something the UK can sensibly walk away from. The Article 50 process is a matter of negotiating an administrative de-merger. Absence of a deal would create an impossible situation. But if Mrs May does "walk", it is straight into the WTO option, the dangers of which she apparently dismisses on the basis that "we would still be able to trade with Europe". She does not in any way acknowledge the administrative complications that would arise, or the very real danger of a complete collapse in trade with the EU Member States. Yet, if we were excluded from "accessing" the Single Market (i.e., trading with EU Member States), she seems to believe that there would be adequate compensation conferred in our ability "to change the basis of Britain's economic model". Missing completely, though, is any sense of timescale. While the effects of the WTO option would hit us within days, it could well be years before positive effects (if any) were felt from a new economic model. And what do we do in the interim? Rather than an answer, as always, there is silence. Where there is no silence - and perhaps there should have been - is over Mrs May's comments on the EU's Customs Union. She repeats the error that full Customs Union membership prevents us from negotiating our own comprehensive trade deals. She then gets tangled up in the further misunderstanding about border controls - which lie outwith the customs union. The woman knows nothing, and has learned nothing. 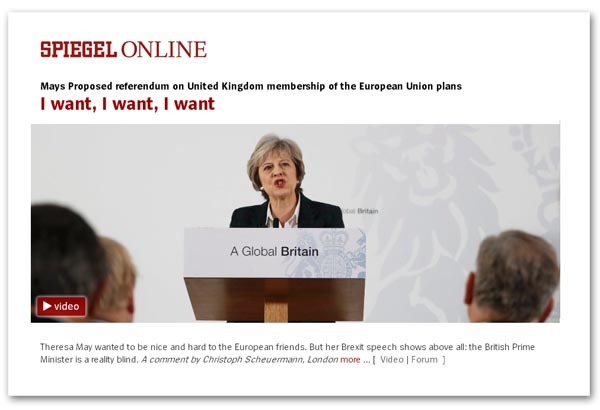 She wants, or so she says, cross-border trade to be as frictionless as possible, not realising that border controls were only removed with the Single Market, the very thing she wants to extract us from. Inexplicably, she adds, "that means I do not want Britain to be part of the Common Commercial Policy and I do not want us to be bound by the Common External Tariff". This is a confused person, one who goes on then to tell us that "these are the elements of the Customs Union that prevent us from striking our own comprehensive trade agreements with other countries". In a small shaft of light, though, she then tells us she wants a customs agreement with the EU, but then – bizarrely – tells us that: "whether that means we must reach a completely new customs agreement, become an associate member of the Customs Union in some way, or remain a signatory to some elements of it, I hold no preconceived position". This is almost akin to the Pope revealing that he has no "preconceived position" on Catholicism, mainly because he doesn't really understand it. And if Mrs May is out on her own, where the hell have her advisors been, feeding her this tosh? How can any nation possibly be an "associate member" of the customs union? Pete picks up with his own analysis, as does Sam Hooper, so the final point I will make in this analysis, which is the first of what will have to be several over the next few days, concerns the money. Says Mrs May, "because we will no longer be members of the Single Market, we will not be required to contribute huge sums to the EU budget". This is issue illiteracy. We pay as members of the EU, not as members of the Single Market. And neither do Efta-EEA members pay into the EU budget. What then follows in Mrs May's comments is worrying. "There may be some specific European programmes in which we might want to participate", she says. "If so, and this will be for us to decide, it is reasonable that we should make an appropriate contribution. But the principle is clear: the days of Britain making vast contributions to the European Union every year will end". One can accept that the "principle" is clear. But we might have expected the Prime Minister to be a little more forthright about what else we are going to have to pay – not least for the decentralised Banking and Medicines Agencies. These, we are probably going to lose, but we will still want to participate in them, plus many others. But they get no mention. Nor does the equivalent of EEA/Norway grants, or even RAL. It is my expectation that the "colleagues" will put the money issue up-front in the negotiations and, in respect of trade and other issues, insist on conditionality. We either agree to pay up, or the negotiations go no further. And despite the glib talk about the EU exporting more to us, it has been made perfectly clear that the integrity of the EU will come first. Even German industrialists and politicians are prepared to take a hit to preserve that. Given the immediate reaction of the German media, I don't think Mrs May's threats will carry much weight. If the UK threatens to "walk", the "colleagues" will stand aside and let it happen. The UK is not the only entity that can restructure its economy. There are plenty of Eastern and mid-European nations which would be happy to pick up the slack. All in all then, my view of Mrs May's speech is that it has been a giant misstep. If she has introduced clarity and a certain amount of certainty into the debate, it is at the cost of the UK's credibility. As such, her speech yesterday may turn out to be the most expensive and ill-conceived uttered by any politician since the war.